Vegetable Explorer is a standalone range of over 50 more unusual and harder to find varieties. Fitting on one, full height hotspot stand, it makes a great addition to our 'standard' collections, offering something a bit different. This season, the range is also available as part of our new M10 collection and, in this selection, will be sorted A to Z in the run of standard vegetable packets. More adventurous gardeners can enjoy trying varieties like; Carrot White Satin and Asparagus Pea. 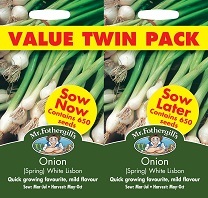 Packets are priced from just £1.60 each.